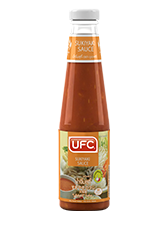 UFC Sukiyaki Sauce is produced from quality ingredients, chili, garlic, vinegar and sesame oil mixed to make a dense flavourful and colourful sauce. Sukiyaki sauce is ready to add to your Sukiyaki broth or even as a dip. This product does not contain any preservatives and is cleanly sealed in certified packaging.